A lean six sigma orange belt is trained on the area of basic problem solving and is familiar with the lean six sigma methods and tools. The Orange Belt is the team leader for improvement projects in his/her direct environment. As a team member, he contributes constructively to larger Green or Black Belt projects. All employees that are involved directly or indirectly with Lean or Six Sigma projects, amongst other process owners, administrative and financial employees, quality assurance employees, operators company leaders, supervisors, and engineers. After this training, you are familiar with the methods as well as with the most important tools, vocabulary, and abbreviations within Lean Six Sigma. You learn what Lean Management or Lean Manufacturing and Six Sigma can mean for your organization and how you can contribute to the improvement of processes. This training consists of 4 days. The Lean Six Sigma Orange Belt for Industry can also be followed in the evening (8 evenings). A Lean Six Sigma Orange Belt training is worth the most when you take your time to prepare and study the study material. We always advise you to take 8 hours of preparation and studying for 8 hours of training. Together the study load consists of 32 hours. However, it can differ for everyone. What is the content of the Lean Six Sigma Orange Belt training? •	What is the content of the Orange Belt training? •	Working together on a practical Lean Six Sigma case. 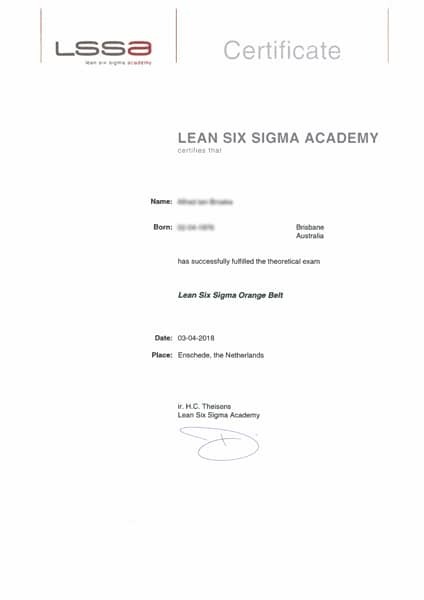 In the open schedule, this 4 day Lean Six Sigma Orange Belt training costs € 1.895,- p.p. •	Dutch training manual with all presentations. 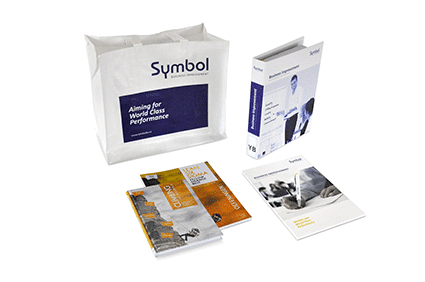 This training can be given for every organization in every industry incompany. An incompany training offers you the possibility to make the training organization specific so that during the training there is a direct translation between theory and practice. Please contact us for the possibilities. Standard all participants receive a certificate of participation. Besides that, we also offer the possibility to achieve an internationally recognized certificate. To this end, we work together with the LSSA(Lean Six Sigma Academy). The exam is in Dutch. Course participants assess our Lean Six Sigma Orange Belt training with a 8.6 out of 10 stars. Based on 243 reviews.